2 or more: $29.35 ea. 11450 Features: -For 2 years and up. 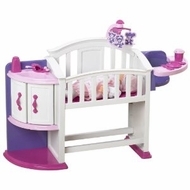 Includes: -Includes: Crib, storage shelf, cupboard, feeding chair and sink.-Also includes a mobile with colorful character decals, a fork, a spoon, plate, sippy cup, and play baby powder dispenser. Assembly Instructions: -Some assembly required.